Okay, so you say “no you don’t“, but hey the URL has headlines written in it, and we would like to think that we did also. Because of this we have been mentioned on other major Japanese music news sites such as excite, rakutan, ameba, and Japanese blogs. 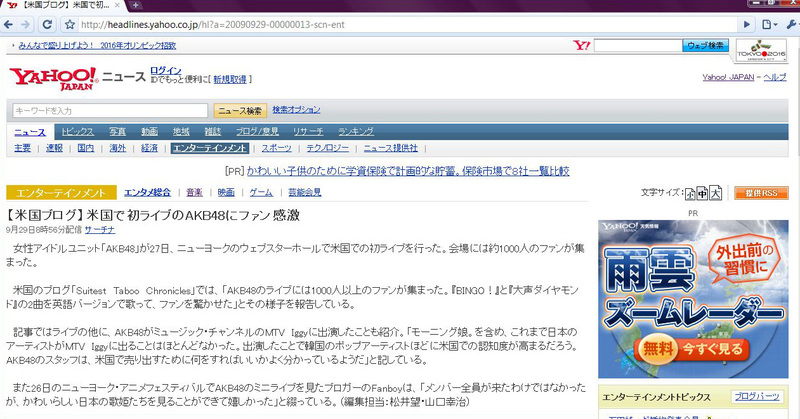 Basically the headline reads “[American Blog] A fan’s deep impression on AKB48’s first U.S. concert“. The premise of the article quoted us on our latest post on idol group AKB48 at the NYAF. While we can’t say we are actual fans, we do enjoy reporting information on this group. We want to thank AKB48 and NYAF, because if not for them we wouldn’t have made it to Yahoo! Japan News. Excellent work! This is my first visit to this site, and seeing as I just clicked “add to blogroll,” you can guarantee that I will be returning to read more! Thank you! I just visited your blog as well! That’s very cool you review almost all the latest releases! I’ll be sure to come and visit to read more!